Dubai: While cities are the foundations of global economic development, a country’s success can be measured by its cities’ innovation, services, and the quality of life it provides for its citizens. 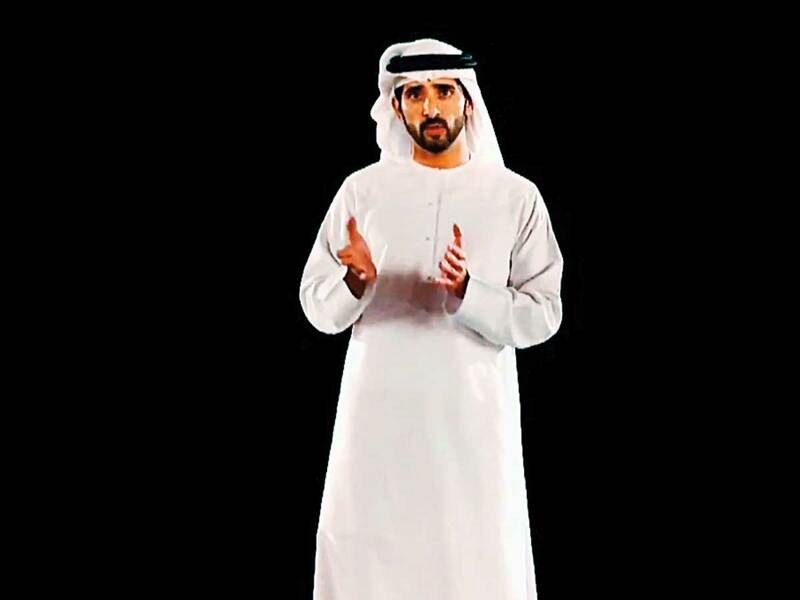 Speaking at the World Government Summit through 3D hologram technology on Sunday, Shaikh Hamdan Bin Rashid Mohammad Al Maktoum, Crown Prince of Dubai, shared his vision of smart and sustainable cities by discussing seven main shifts that will shape the future of cities around the world — before appearing on stage to greet his audience. “Discussions on the future of our cities around the world begins with Dubai as many cities view Dubai as a city of the future. Our goal, as described by Shaikh Mohammad is to put Dubai 10 years ahead of world cities,” said Shaikh Hamdan. He discussed a shift in the design and nature of cities from traditional models built to cater to transport and industrial needs, to cities that are designed to achieve a better standard of life to meet 80 per cent of people’s needs in under 20 minutes. Shaikh Hamdan also spoke about the change in mobility in future cities, pointing out that easy access has a direct impact on happiness levels. Currently, the average time of moving around in a city is 60 minutes, and could reach up to 1 hour 20 minutes due to traffic. According to a report by the University of West England, every 20 minutes added to time of mobility reduces happiness, and as a result salaries by 19 per cent, explained Shaikh Hamdan. “In the cities of the future, we will focus on creating new routes, including air and land, such as Hyperloop and others … If we turn five per cent of the transportation into self-driving means, the congestion will decrease by 40 per cent,” said Shaikh Hamdan. Looking at the future use of energy in cities, Shaikh Hamdan said according to reports by the International Energy Organisation, energy from solar panels will be 16 times higher by 2040. “In the cities of the future, our homes will be transformed into environmentally friendly homes and each person will become consumers and producers at the same time, and every house will be able to store the energy it needs for the next 24 hours,” he said. While there will be a reduction in the cost of the production of clean energy, the role of energy and power authorities will also change from being a centralised system to a decentralised system, as each home independently generates the energy it needs. “By 2050, the world’s population will double, so be aware of the issue of food security,” warned Shaikh Hamdan. He explained that while people continue to shift from rural areas to urban cities, there will be an increase in the need for food production by 70 per cent in developed countries and 100 per cent in developing countries by 2050. “Future cities will play a key role in supporting farmers and facing the challenge of global food security … The cities of the future will be the food basket for individuals thanks to the flourishing of food production techniques, which will increase the level of competitiveness among cities,” he added. The introduction of horizontal farms will be an important solution to the future food security crisis as they will ensure that most of the populations needs are produced inside the cities. Shaikh Hamdan also addressed the future revolution in the production of data, which populations will rely on for all aspects of life. “Cities will become more connected, secure, productive and intelligent, there will be a decrease in crime rates thanks to AI … and the number of internet of all things devices will grow to 500 billion by 2050,” he added. Future cities will see three new economies, data economy, sharing economy and circular economy, which will change methods of consumption and services, replacing the traditional oil economy in the region. “The EU data economy is currently worth $350 billion, which equals to 60 per cent of the production of oil by Opec countries,” said Shaikh Hamdan. The need for agile leadership and innovative ways of government was listed by Shaikh Hamadan as the seventh shift to be seen in cities of the future. “Innovation platforms will provide solutions to the challenges as city leadership is linked to its boldness and innovation for unconventional solutions,” said Shaikh Hamdan. In the cities of the future, energy providers will become a platform to exchange ideas and information through blockchain, while the individual and the private sector will be able to collaborate in designing their requirements through innovation platforms, explained Shaikh Hamadan. He pointed out the competitiveness of cities is not limited to the quality of the business environment and infrastructure, but also to the polarisation of minds and talents and the establishment of values of tolerance, cooperation and prosperity. “We are all partners in building future cities, it is not only the job of governments. Every seed we will grow now will become a tree in the future,’ said Shaikh Hamdan. “We must remember, the future is not technology or AI, the future is the human being, and the future is us plus what we add to the knowledge and experience we have and what we add to our hearts of tolerance and compassion,” he added. Most cities were designed in the early 1900s with the invention of cars. The design of cities was based on three tenets: the number of cars, population density (Number of people living in an area), and areas designated for industrial and economic sectors of traditional economic return on the city and the state. This requires redesigning now to keep pace with the modern age. This is because of the impact of the current design of cities on individuals, in terms of social coherence and solidarity. Electricity was the artery of life in cities in the 20th century which led to the emergence of machinery and automation of human effort in the second Industrial Revolution. Today, artificial intelligence is as important to the cities in the 21st century as electricity was important in the 20th century. If technology is changing our lifestyle in cities, it will definitely change the way we consume resources to become more efficient and environmentally friendly. Homes in future cities will be transformed into small power-generating plants. Every person will become an energy consumer and producer at the same time, and may supply the main electric grid with his surplus production. Cities of the future will serve as open platforms for connecting minds and developing ideas and innovation, given that major inventions and innovations that shaped the history of humanity were made in cities or demographic blocs. Attraction of qualified and talented manpower creates a huge advancement in technology and creates opportunities for economic sectors to prosper. It also creates new jobs that will represent the assets of future cities.